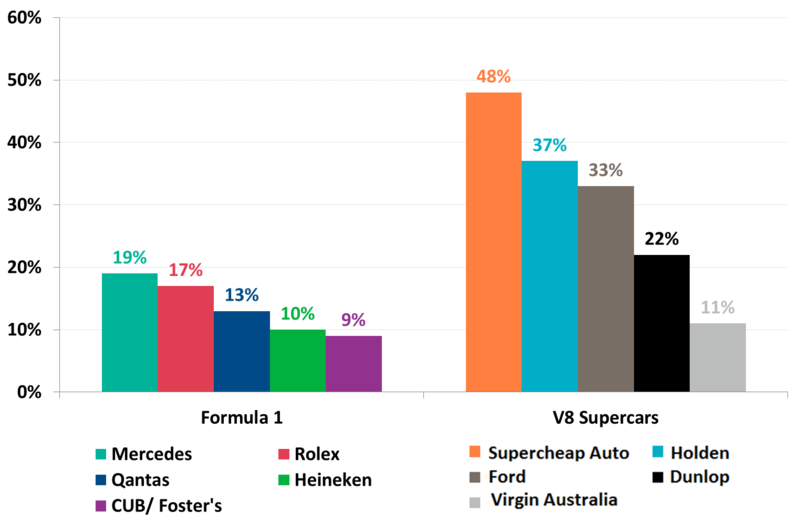 The F1 season kicked off in Melbourne over the weekend however when it comes to motorsports Australian fans have a far higher recall for V8 Supercars sponsors than for the Formula 1 sponsors according to new Roy Morgan research. Over 4.9 million Australians watch motorsports including Formula 1, V8 Supercars, the Bathurst 1000, Drag racing and Rally car racing on TV with nearly 2.8 million watching V8 Supercars and over 2.3 million watching Formula 1 in 2018. As well as those watching on TV around 550,000 Australians attended a motor sport event in 2018 such as the Formula 1 Grand Prix or the Bathurst 1000 V8 Supercars. For those attending a motorsports event over the last year nearly half, 48 per cent, associate Bathurst 1000 naming rights sponsor Supercheap Auto with V8 Supercars. Other companies strongly associated with V8 Supercars are traditional automotive manufacturers Holden on 37per cent and Ford on 33 per cent. Tyre manufacturer Dunlop, long-time sponsor of the second tier Super2 Series is associated with V8 Supercars by 22 per cent of motorsports attendees in 2018 and V8 Supercars naming rights sponsor Virgin Australia is associated by 11 per cent of motorsports attendees with V8 Supercars. When it comes to F1 it is five-time reigning constructors champions Mercedes on top with 19 per cent of motorsport attendees associating the German auto manufacturer with F1 ahead of Melbourne Grand Prix naming rights sponsor Rolex mentioned by 17 per cent of motorsport attendees. Other brands firmly associated with F1 include the former Australian Grand Prix naming rights sponsor Qantas by 13 per cent of motorsport attendees, official F1 sponsor Heineken by 10 per cent of motorsport attendees and former naming rights sponsor CUB/ Foster’s by nine per cent of motorsport attendees. Commenting on the research, Roy Morgan CEO Michele Levine said: “Every year hundreds of thousands of Australians flock to the Melbourne Grand Prix held at Albert Park racing circuit in mid-March before the global sport departs for foreign shores for the remainder of the year. “Over 2.3 million Australians watch Formula 1 in a given year whether the home race in Melbourne or races from overseas held at all hours of the day and night. However, when it comes to motorsports, over 2.7 million Australians watch V8 Supercars and over 3.5 million Australians tune into the V8 Supercars ‘Grand Final’ the Supercheap Auto Bathurst 1000. “These figures illustrate the power of the V8 Supercars Championship as a commercial vehicle to reach millions of Australians throughout the year. The V8 Supercars Championship currently consists of 15 rounds held between March and November with the second round held concurrently with the Formula 1 Grand Prix in Melbourne over the weekend. “The strength of the V8 Supercars is also evident when one considers how motor sport attendees in Australia recall the major brands and companies associated with both the Formula 1 Grand Prix and the V8 Supercars. Brand recall is far higher for the V8 Supercars than Formula 1. “Although Formula 1 captures the imagination in March, the lack of visibility for Formula 1 content throughout the remainder of the year means sponsor association with Formula 1 is significantly lower than for the Australian-based V8 Supercars Championship. “The leading brands associated with the Formula 1 Grand Prix are led by reigning Formula 1 Constructors champion Mercedes mentioned by 19 per cent of motorsport attendees as well as Australian Grand Prix naming rights sponsor Rolex associated with Formula 1 by 17 per cent of motorsport attendees. “For companies looking to tap into Australia’s nearly 5 million car racing fans the V8 Supercars, Bathurst 1000 and Formula 1 Grand Prix offer significant opportunities to reach these motor sport enthusiasts,” Levine said.